About three years ago I took this picture inside a subway station somewhere in New York, either in Manhattan or Brooklyn. Now that I'm back in New York for a short while, I'd like to track down this place once more. 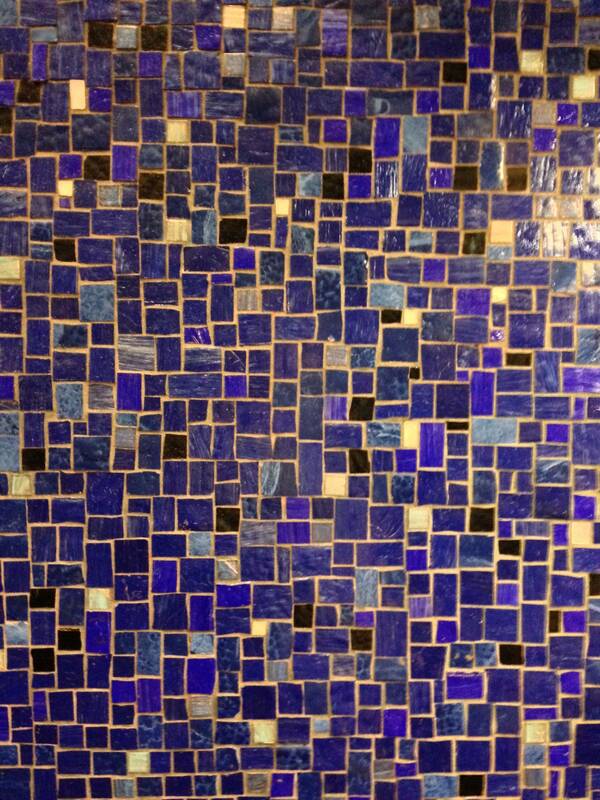 Which station could I find this blue-tiled wall in? My first inclination was to guess that it came from one of the station signs, as at 23rd St, but the tiles in your photograph seem to be smaller and more irregular, as well as brighter, and so may have come from a larger mosaic. As such, I don't have a definite answer for you, but will point you to the most comprehensive collection of NYC Subway art I could find, from unofficial/fan site NYCSubway.org. They currently have 295 works in their Subway Art Guide. Tile mosaics featuring large swathes of dark blue include Blooming by Elizabeth Murray at Lexington Ave / 59th Street (4/5/6/N/R/W services), and Happy City by Peter Sis at 86th Street Lexington (4/5/6 services), but again the pattern does not quite match. There are a few others with expanses of blue tile, like at Court Street or at Eastern Parkway, but you say you didn't spend any time in those parts of the city. So the best I can offer is to look through station-by-station to see if anything jogs your memory. It's also possible that the photo you took is not technically of part of the station, but part of a pedestrian accessway from a building or other structure. Not the answer you're looking for? Browse other questions tagged public-transport new-york-city identify-this or ask your own question. What is the optimal place to meet in NYC to begin a road trip?